Hi Everyone, and happy May! It’s getting to be that time of year when I live in dresses. 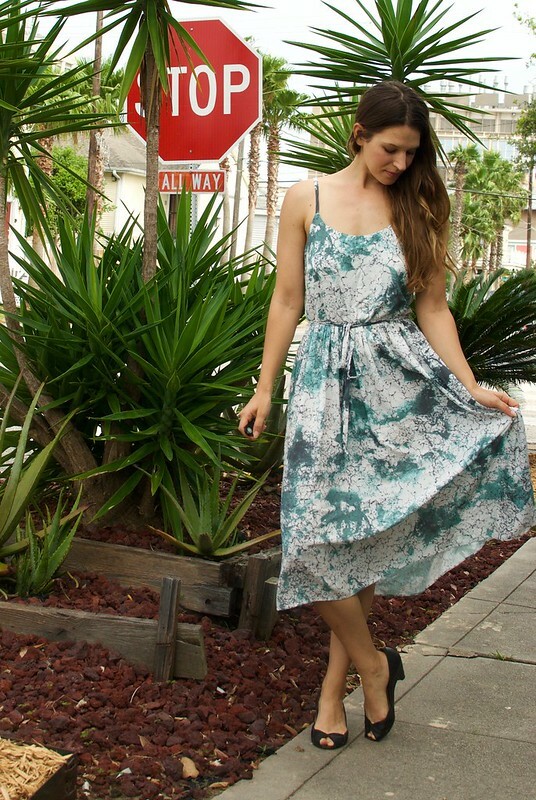 There’s nothing better on a hot, sticky day than throwing on an easy, breezy dress and a pair of sandals, and that’s exactly the type of garments I’ve been interested in sewing lately. In my climate I can really never have too many sundresses! This month for the Mood Sewing Network I decided to delve into this scrumptious Dusty Turquoise/White Marble Rayon Print from Mood Fabrics online. Rayon challis is one of my favorite fabrics to wear. It has many of the same qualities as silk – a gorgeous fluid drape, it’s lightweight, and breathable, but it feels less formal than silk, making it perfect for the sort of wear-everyday-for-every-occasion dresses I like to try to fill my closet with. But of course what really stole my heart was this fabulous, modern marble print! As you probably know by now, I’m a sucker for a good print, especially one that seems a bit unusual or hard-to-find. And this print was just the thing to turn a simple dress into something more unique. The pattern is Catarina from Seamwork. This was a very straightforward pattern, however it took me much longer than the suggested time of two hours! Then again, I’m not sure I could sew a pencil case in two hours! The top is double layered with bust darts, and the skirt is a simple gathered, slightly a-line, rectangle. The waist has clear elastic sewn into the seam allowance to give some shaping and there is a skinny tie belt to go with it. Perhaps my favorite part on this dress are the bra-strap style spaghetti straps. It would be so easy to cut the straps to your preferred length and skip the step of fiddling with the bra ring and slider, but I feel like it gives this otherwise straightforward dress a little something something. I’ve already worn this dress a ton since I made it a few weeks ago! It seems perfect for just about every occasion – work, date night, drinks with friends, walks on the beach… While I think it’s really special in this print, I’m thinking I might need a few more in some solid colors too – good thing Mood’s got me covered there, too! What’s your favorite style to wear when the weather gets warm?